У меня вообще Шанди Шикблеска нет не на болконе,не в здании! ЧЕ ДЕЛАТЬ! я нажимаю на Шанди Шикблеска и мне не даёт накидку. Мне говорят рядом мешочек из него брать а я не могу взять. Чё делать подскажите? Нужно встать на мерцающие предметы и внимательно слушать гнома! Скажет что - юзаем! и все! квест сдан! Я вам скажу как его быром сделать. Короче берете у бармена (у которого кв брать) книгу клинков дракона чето вроде того, и потом к шанди идете и кв быстро выполняется. Встать удобно вот так и слушать, что чувак говорит. Вместо исподнего он говорит, что-то другое, но тоже на "и". Easy Quest. Go to The Threads of Fate and upstairs and out to the balcony. This quest is like Still At It where you have to click on what ever he says. You just have to do what ever he says after you have done it you have to loot the Tabard which is next Laundry. I have uploaded a picture where you can stand so you can click on all of the things. Since I had problems finding the "Threads of Fate" shop in Dalaran I assume, most other will also have the same problems. The store is to the righ, if you are standing in front of the stair with the Violet Citadel to your back (to the left is the toy store). I posted a picture of where the clothing will spawn on the ground, if your server is crowded like mine. Here's the entire quest chain, with simple descriptions and quest links for the Horde versions. Bring the Battered Hilt to Myralion Sunblaze at Quel'Delar's rest, south of the Argent Tournament Grounds. Speak to Krasus at the top of Wyrmrest Temple. Obtain the Orders by killing an NPC in the Dalaran Sewers. Make sure you kill the right one. Obtain a Borrowed Tabard from Shandy Glossgleam; He is upstairs in the Threads of Fate: if you are standing in front of the stairs with the Violet Citadel to your back, it is to the right (to the left is the toy store). Retrieve the Ancient Dragonforged Blades tome from Arcanist Tybalin. 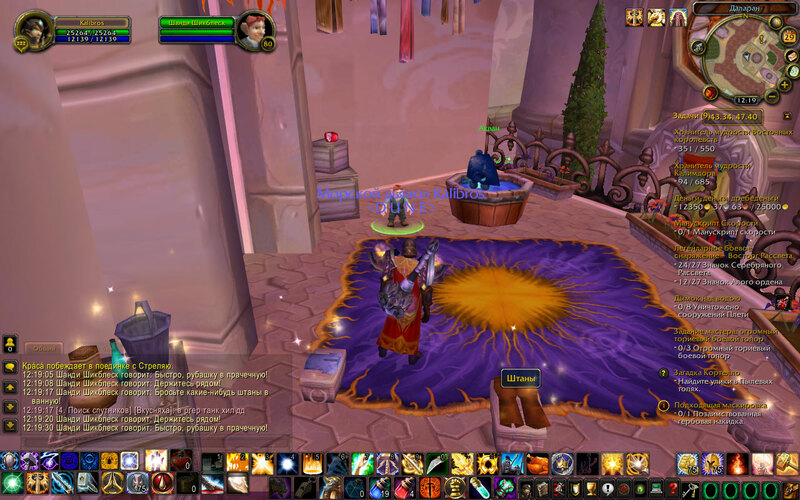 Use the disguise and go in the Alliance section of Dalaran. Bring the Ancient Dragonforged Blades to Myralion Sunblaze at Quel'Delar's Rest. Speak with Halduron Brightwing at the entrance to the Sunwell Plateau on the Isle of Quel'Danas. Bring the Restored Quel'Delar to the NPC at the Violet Citadel in Dalaran. A lot of this info came from comments people left on the various quest pages. Thanks to all those who posted useful tips! Seems to be bugged for me in live, although not for everyone on my server. I cannot interact with the objects. I'm on an epic quest to reforge the ancient and mighty Quel'Dalar, and they have me cleaning laundry! Had a good laugh in trade chat about this one. Shandy Glossgleam: "Aquanos, stop sending the clothes so high! You didn't have to see the look on Aethas Sunreaver's face when he found his pants in the fountain!" If someone else is currently doing the quest, you don't have to complete it yourself as you can also loot the bag containing the tabard. i think the quest is bugged on my server. cannot interact with shandy glossgleam. well you can click on him, but the only thing he says is that he does de laundry for a nominal fee. Ok, here's a question that hasn't been brought up before; Where do you loot the tabbard from? The guy walks off and nothing happens; nothing appears in your bag, nothing appears to be picked up and the gnome just dissapears when he hits the staircase. He says something about "pick it up by the clean laundry" but that doesn't tell us anything as there is no clean laundry inside or out that you can interact with. Позаимствуйте у Шанди Шикблеска гербовую накидку. Заслать тебя в Серебряный Анклав будет нелегко. Туда допускаются только обладатели гербовых накидок Серебряного Союза. Если бы нам только удалось заполучить одну из них, остальное можно было бы решить с помощью пары заклинаний. Ну что, Шанди помог тебе добыть гербовую накидку Серебряного союза? Я так и знал, что Шанди найдет выход из ситуации. Сейчас я наложу чары на эту накидку, и ты сможешь ее примерить. Чем быстрее ты вернешься, тем быстрее мы отдадим ее обратно Шанди. Возможно, за это время ее владелец не успеет хватиться своей гербовой накидки.